Bad sanitation methods and facilities is as big a contributor to the spread of water-borne disease as is unsafe water. 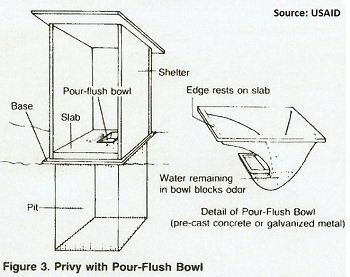 Introduction to Sanitation Facilities, Part 2 includes information concerning "aqua" privies, compost toilets, bucket latrines, and wash water disposal techniques. Having a source of clean water and possession of household water treatment options such as filtration and disinfection will not solve all the problems related to transmission of dangerous pathogens. As mentioned in "Origins of Contamination" , there are several ways that disease-causing pathogens can spread and become ingested, resulting in disease and sickness for individuals. On that page, we mention that “Poor Practices Present Open Pathways”. Bad sanitation practices and lack of adequate facilities may allow pathogens found in human feces to be ingested by humans through being passed along by animals, flies and insects, on food, and on hands. All of these can provide a pathway for pathogens to move from feces to mouth. This is the rationale behind the WASH concept (WAter, Sanitation, andHygiene). Clean water, adequate sanitation, and good hygiene practices must be integrated into our daily lives and utilized together in order to block all the potential pathways through which disease can be transmitted. What good is a source of clean water if the containers in which it is carried and the hands with which it is handled are contaminated with disease-causing pathogens? How easy will it be to keep food, hands, and containers clean if human feces is spread throughout the environment through bad sanitation, without regard for the dangers of contamination through spreading by human feet, livestock, insects, etc.? In the least developed areas of the world, it is still a common practice to defecate on the ground. This is definitely a bad sanitation practice. One missionary told me that in the 1960’s, when he was serving somewhere in Africa, that the local term used for “going to the bathroom” (so to speak) was the phrase in their language that translated as “going out back”. When they needed to “go” they simply went “out back” somewhere and did their business. Again, bad sanitation practice with no sanitation facilities. This is open defecation and it is the worst scenario for transmission of disease. In addition to this, another bad sanitation practice is when people urinate or defecate in a river or other water source. Men pee with their backs turned. Women often go behind bushes for privacy. Children have the tendency to go anywhere! According to the progress report of the WHO/UNICEF Millennium Development Goals , the number of people without an improved drinking water source has decreased from 1.1 billion to 884 million since the 1990’s. The number of people living with bad sanitation practices and inadequate facilities sanitation is greater than that! WHO/UNICEF estimate that 2.5 billion people (38 percent of the world’s population) live without improved sanitation facilities. At the very least, human feces should be buried so that ground surface activity won’t spread the feces and the pathogens it contains around the community. The definition of “improved sanitation facilities” is those facilities that hygienically separate human excreta from human contact. However, sanitation facilities are not considered improved when shared with other households, or open for public use. So, sanitary facilities need to keep human excreta separate from other activities. They need alleviate bad sanitation by keeping excreta contained and confined. They need to isolate excreta from any water source. But also, good sanitary facilities need to address human needs such as privacy and security and protection from the elements. If these requirements are met, people will more likely find that using an improved sanitary facility is more desirable than not using it. This will result in a decrease of bad sanitation. I had one young man in Ecuador ask me why the smelly hole in the ground (the latrine) was better than burying the stuff in places where it could not be seen or smelled. I tried to think of an apt analogy, so I asked him, if there was a bunch of criminals in your community, wouldn’t it be better if they were all in one jail rather than spread all around where they could not be seen or smelled? He didn’t live in a very large community, but he did get the idea. Any development project that aims at an improvement in sanitation requires a Project Planning Phase. Good planning is required to assure that the community is the major originator of and the major stockholder in any improvements that might be made. Planning is often a neglected step in the development process, but it should not be neglected. If we are willing to spend days or weeks in the construction of improved sanitation facilities, then we should be willing to spend an equal amount of time planning for the success of those facilities. The simplest methods of disposing of human waste (beyond just the simple burial routine) use a pit of some kind or a bucket. 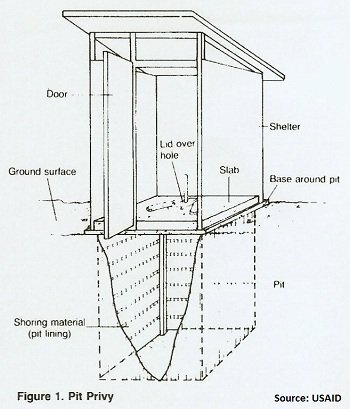 The pit of a simple pit latrine (Figure 1) is dug in a location where soil suitability and permeability are favorable for waste disposal. The pit walls may be shored up with boards, bricks, or stones, if needed. 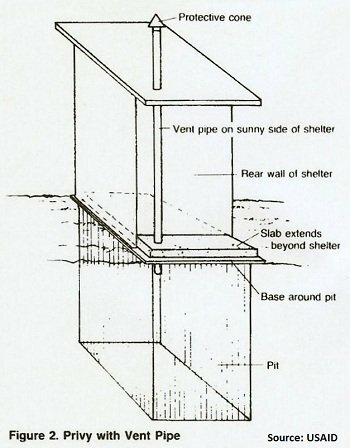 Pit latrine slab construction , shelter construction, and pit construction methods are fairly simple. Improvements can also be made to simple pit latrines. Additional improvements that can be added to the simple pit latrine include a vent pipe or a pour-flush bowl (Figures 2 and 3). 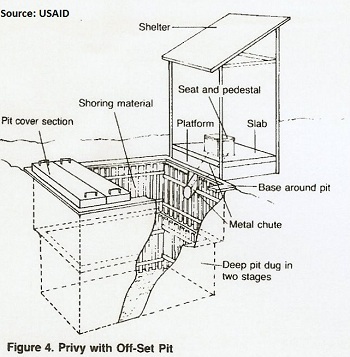 The pit may also be dug in an offset position from the slab, which allows for the use of a larger pit that is more separated from the user (Figure 4). The purpose of sanitation facilities is to contain and confine the contaminated material from any water source and to prevent the spread of disease through the activities of humans, animals, or insects. Sanitation facilities must also provide for the security, privacy, and dignity of the people who use them. Return "Home" from "Bad Sanitation"